Tiny sneak peek at what I was doing today. Trying out some digital painting techniques that I’ve learnt from YouTube, and some things that I’m discovering on my own. I decided to try putting abase gradient down, then colouring the area based on what colours lands there. The picture that I’m using, I showed you a while ago, named fire fairy. I haven’t put her wings on, and I’m not sure I will on this version. I’m imagining this on a shirt, so I want to get it right. 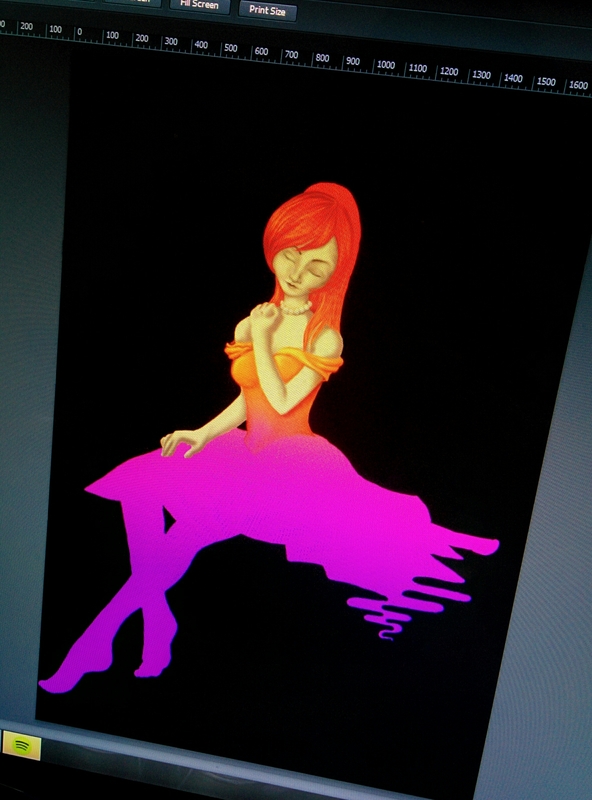 I need to change her hand position, and her back leg is too short, but I’m taking my time and having fun. It is a little unusual go change the sketch this far in, but I knew it didn’t look right, but didn’t know how to change it. Now I have a couple of ideas. I’ll work on it between cleaning and sleeping. Bunny is coming along nicely. Just need to finish and attach some arms, and decide where to put the eyes. She’ll need some buttons on her dress, too. I’ve figured out that to get it smoother, you have to wipe your finger across the surface to hold down the long bits, and work them in. Also, if you switch to a smaller needle to finish the outer layers, it’ll have less big holes in the end, despite taking longer. It’s worth the effort to make it look nice. I found the flesh coloured yarn that I wanted, just before bed, so I haven’t had a chance to use it yet, and work on the doll further. I’m not sure how I’m going to work the hair. Maybe making it a static felted ponytail will be the best action, so it doesn’t need care or styling. I considered the other day getting plain white wool, and seeing if I could colour it with copic markers, after I’ve made the figure. 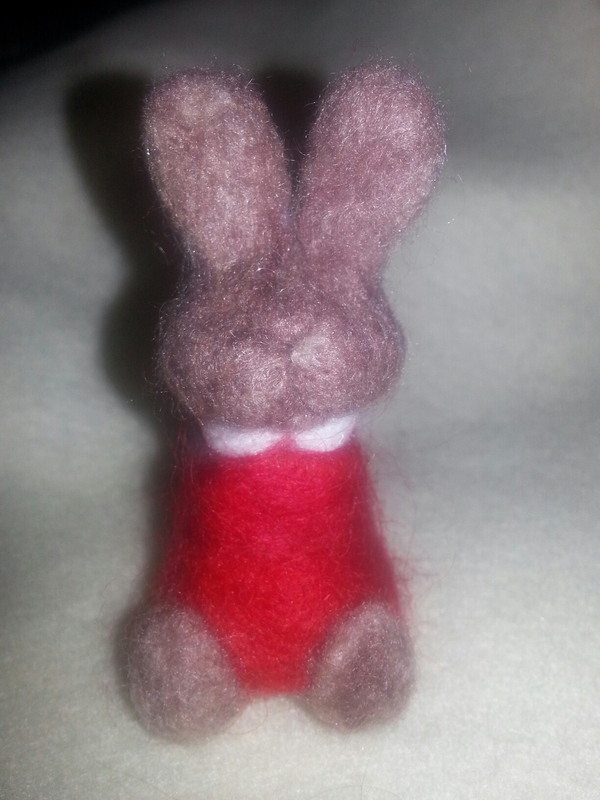 I’m yet to try it, as I don’t have any white wool, but I do have some yarn (which I used for the bunny’s collar.) Perhaps I’ll try it on this, or even on the yellow wool. 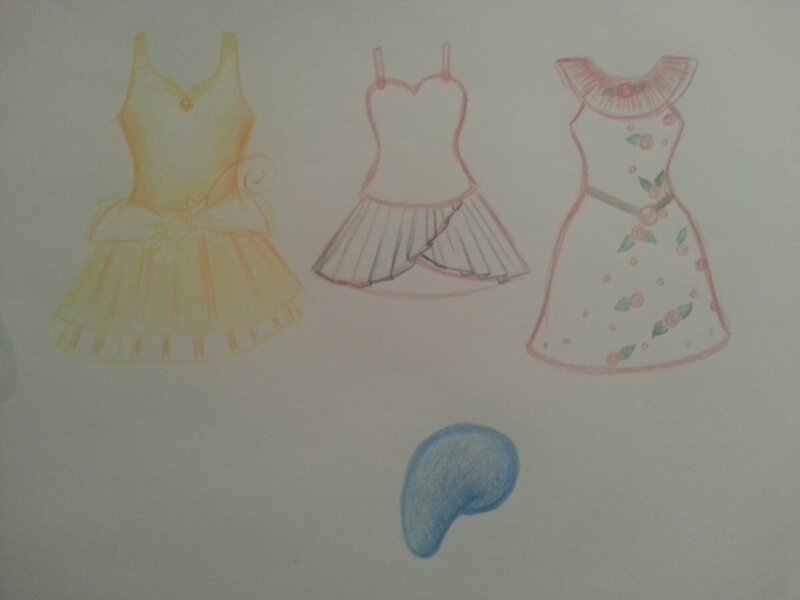 I’m continuing with toy clothes today had a few ideas last night to try. First we have Andrea on the left sporting a polka dot dress. Hand sewn by me- I’m trying to decide if its more lazy to get out the sewing machine, or to hand sew because you couldn’t be bothered getting the machine out. Then I had an idea or saw on a video that had dolls hair curlers using bobby pins and straws. So I’m trying it out. 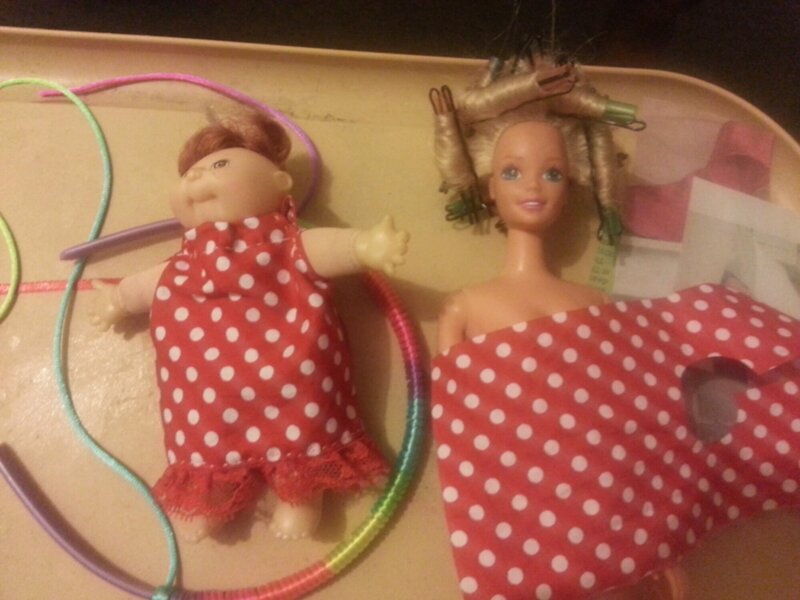 I wet the dolls hair first, and I’ll wait for it to dry, and I’ll add hair spray before and after I take them out. The headband is just a piece of cord I was playing around with and wrapped it around a headband base. I like the gradient a lot, so I glued it in places, and might do some stitching to make sure it stays. Toys clothes! The first craft items I made and what got me to love Sewing. Lately, my Mum and I have been discussing making dresses for toys, so today I felt like making one. It was all hand stitched, as it was a trial run, so the thread doesn’t even match properly. Also I didn’t burn the ribbon ends, so they’re beginning to fray. Although you can’t see, the bodice is supposed to be pleated, but I didn’t want to iron, so I tacked it down, and it just looks like a random seam. I love the blue and white combination, but found a few more fabrics that would be nice. Despite getting a fair bit done today, shopping and homework, this was all the completed art I did. Basically messing around with pens and paper. It started by looking for a hexagon paper punch online, then remembered how many people sell punched out bits of paper. So I decided to punch out bits of paper… mainly to see how much effort and paper went into it, to see if I could add it to my craft stall ideas. Some punches were easier on the hands than others. As usual I began experimenting. I punched cirles then smaller shapes inside. Then realised its much easier to punch the small one first, then the circle. Then I punched from catalogues. Then I made a tiny rose out of the catalogue. Then I made a tiny rose out of purple. Then after a while I noticed my fashiony sketchbook and kind of drew a dress I saw using scumbling as the pattern. I photographed it then began blogging about it. Then here we are… never did find that hexagon punch at a good price. I had a few minutes to watch YouTube and draw this morning. I’m loving a channel named Kellie Reynolds. 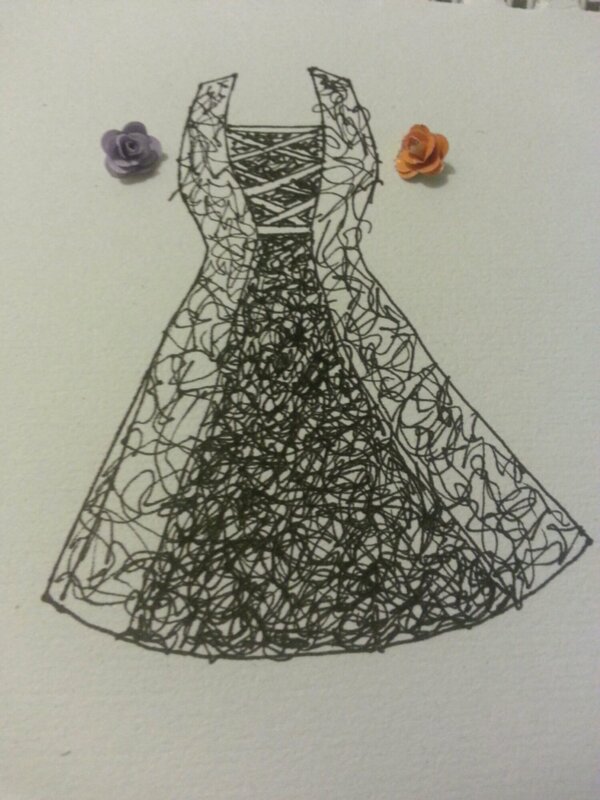 This lady creates paper dresses and corsets which are beautiful. She makes little hangers for them and they are in all different themes. It’s first on my list to make once I’m set up and able to create. I’m glad I have my paper and pencils or I’d be going crazier. I imagine these would be lovely on a card front, or as an embellishment on a mixed media canvas. Even framing them in a box frame would be lovely.